Bernie Sanders has run the Energizer Bunny of presidential campaigns — and his battery isn't dead yet. On Tuesday, Sanders took on Hillary Clinton in some of the last — and biggest — primaries of 2016, in states like California and New Jersey. 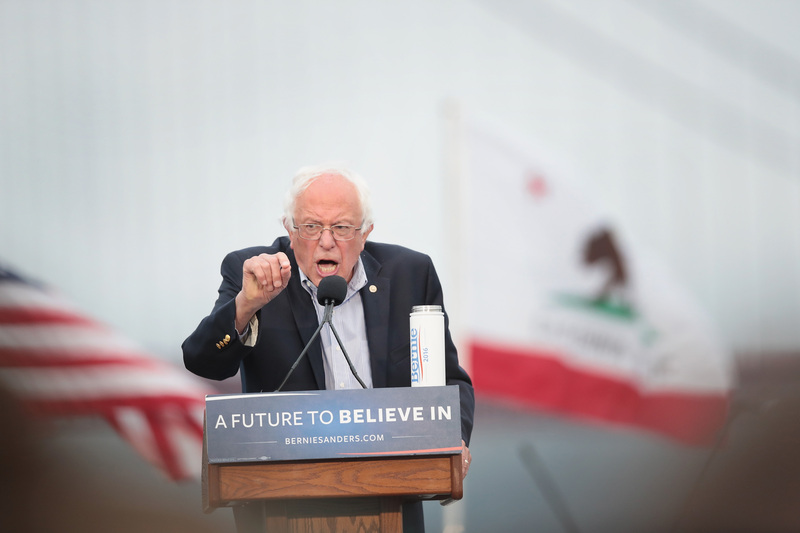 Although he didn't exactly stop the overwhelming celebration from the Clinton camp, Sanders vowed after California to stay in the race until the very, very end. In fact, Sanders declared on Saturday, "The Democratic National Convention will be a contested convention," because he'll be there to fight until the finish. He told reporters at a news conference that he'd be going after Clinton's superdelegates to weaken her lead. After all, the superdelegates will technically be up for grabs until the convention in July, whereas the pledged delegates will all be allocated by the middle of next week when Washington, D.C. hosts the final Democratic primary. Despite the widespread consensus that seems to think Clinton already has the nomination locked up, Sanders reiterated his desire to continue campaigning during a late-night speech on Tuesday. Next Tuesday, we continue the fight in the last primary in Washington, D.C. We are going, we are going, we are going to fight hard, we are going to fight hard to win the primary in Washington, D.C. And then we take our fight for social, economic, racial, and environmental justice to Philadelphia, Pennsylvania! I am pretty good at arithmetic, and I know that the fight in front of us is a very, very steep fight, but we will continue to fight for every vote and every delegate we can get. Tonight I had a very kind call from President Obama and I look forward to working with him to ensure that we move this country forward. And tonight, I had a very gracious call from Secretary Clinton and congratulated her on her victories tonight. Our fight is to transform our country and to understand that we are in this together. To understand that all of what we believe is what the majority of the American people believe. And to understand that the struggle continues. No matter what happens between Tuesday and the Democratic National Convention in July, Sanders will have left his mark on the Democratic Party. He has energized a large subset of the American population to vote for him, and he lasted far longer than many of the other candidates, Democrat or Republican, even in a race that seemed to be Clinton's all along. Whether he remains a candidate or eventually falls behind Clinton, Sanders will likely have a say at his party's convention later this summer.